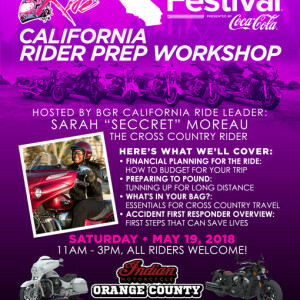 Budgeting for your ride – A quick guide to financial preparation for your long distance ride ‹ Black Girls Ride Magazine | Motorcycles, Accessories, Biker Fashion and Events for Women Who Ride! Day to Day Essentials: Food, Gas, Lodging – These are the barest essentials of every long distance trip. 1. Food: $20 – $35 a day. Food is the easiest way to trim costs on the trip. Generally, long distance riders will snack throughout the day on trail mix, water, and gatorade. We’ll leave the heaviest meal to the end of the day’s ride. Eating large meals all day long will not only drain your pockets, but heavy meals will have you feeling sluggish throughout the ride. – Purchase snacks ahead of time if possible. Buying at gas stations and convenience stores will have you spending $3 – $5 at each stop, which can add up fast! – Sugar will make you thirsty. Avoid candy and sweets. – Eat a good meal at your final destination. – Choose hotels that have breakfast included. This saves you at least $10 a day in food. Gas prices fluctuates based on region, and whatever is going on politically. From what we’ve seen over the last few months, it’s an expensive summer to ride. Gas is estimated at $3.55 per gallon currently. We suggest $15 – $20. Though, you won’t probably spend it all, it’s nice to have in an emergency situation. – Get the Road Trip Gas app* (available on both IOS and Android) to estimate your gas costs before you ride. – Register for gas loyalty points where you buy gas daily. – Pay for gas inside, and not at the pump! On the road, gas stations may hold as much as $150 on your card during a fill-up. This money may be held for up to 3 business days before it’s released back into your account. When you’ve got 10 stops a day for gas, that can add up fast. We also suggest you pay inside to avoid credit card fraud. Lodging – hotels range from $49 – $150, depending on your preference. Lodging will depend on your personal preference. Some folks need at least 3 star accommodations, and some will camp out in the wild. Be sure to plan your stay before your trip, if possible. – Stay with the same hotel chain and use hotel points to accumulate nights. – Share a room with a riding buddy. – Stay with friends and family when possible. Avoid staying with “online friends” you haven’t met. – Stay safe – be sure to ask hotels about motorcycle parking, and lock up your bike! Nothing ruins a group trip faster than someone who isn’t financially prepared to have fun. At this stage in life, we’re too old to be the friend who needs to bum cash on the road. We suggest putting money aside just for the fun stuff… t-shirts, museum visits, a really good steak, are a few things that come to mind. – Carry cash for gas stations that may not take cards, and anything you may want to buy along the way. – Avoid buying “things” that may load you down and try to use your cash to make memories! – Have a credit card reserved for major issues. – Pre-schedule any maintenance you’ll need on the road to budget for service and to avoid Up charges. – Purchase roadside assistance. If you have it via insurance or rider group, double check the ability along your route and what they will provide. – Have your Health Insurance and Motorcycle Insurance info handy. – Bring your bike warranty info, just in case you need major service on the road. These are just a few quick tips that come to mind… What would you add to this list? Drop us a line and let us know!